I love it when people just go with their own style on their wedding day, even if it means wearing something unconventional. When I was shopping for a wedding dress a few years ago, I tried on some traditional white dresses, and while they were all stunning, I kept coming back to the one I tried on first. The dress I went with (below) is beautiful corset with a watercolour floral print and lace applique flowers in red. I'm biased towards red and the pops of colour was just so perfectly me. I shot Cassi and Chris' elopement a few years ago. Their dog was the "best man" and Cassi rocked a stunning red lace dress with beige heels. It's red, so I love it. 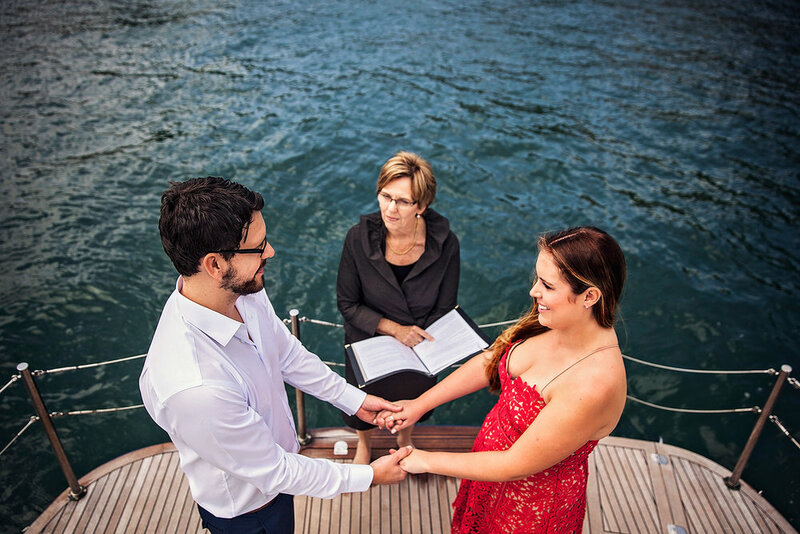 But I also love that they did their wedding the way they wanted it - an elopement on Sydney Harbour with a small group of friends and family there to celebrate after. This soft lilac dress was perfect for bride Lynda. Her whole wedding was fairly unconventional, including an announcement of her pregnancy after the ceremony. I hope to shoot more brides wearing colour in the future. This dress gets an honourable mention for being unconventional as bride Brenda bought it from ASOS. The ivory vintage-inspired beauty was bought for under $300 and was altered to suit Brenda's body. I really loved this dress, especially the flutter sleeves. Her hair and styling was stunning, especially those red shoes (yes!) - custom from Shoes of Prey. It's great to meet brides who don't feel the pressure to spend big on their dresses. This dress caught my eye on Instagram one day. The bride is an artist for Adelaide brand Tiff Manuell and she painted her own dress. Amazing!